A Rare ‘Mutant’ Mermaid Captured in Indonesia? Supposedly, a strange ‘mutant’ mermaid was captured in Indonesia by a group of fishermen, which caused great fear in thousands of netizens. 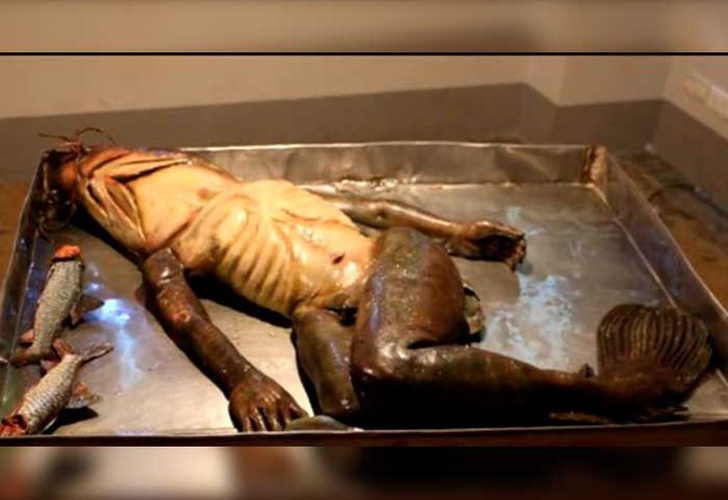 A few days ago, YouTube uploaded a video that showed a strange creature that had half the body in the shape of a fish and the other half was similar to a human being, something that caught the attention of thousands of people, who baptized him as a ‘ siren ‘. It is real? According to the description of the video, this creature was captured by a group of fishermen in Indonesia, who were terrified after catching it; however, that is not the true story of this ‘ sea monster ‘. Just revealed the mystery behind this strange creature, half fish, half human, a truth that has left thousands of netizens open-mouthed. This strange creature was not caught in Indonesia and it is not a mutation produced by radioactive waste, but it is a sculpture work done by a talented Thai artist. Investigating the origin of the video, it was discovered that it was presented during an exhibition held at a University of Arts in Thailand, which aimed to make people aware of nature. Although at first sight the creature looks real and taken from a horror movie, the truth is that it is created with silicone.